with regular exams. Call today. 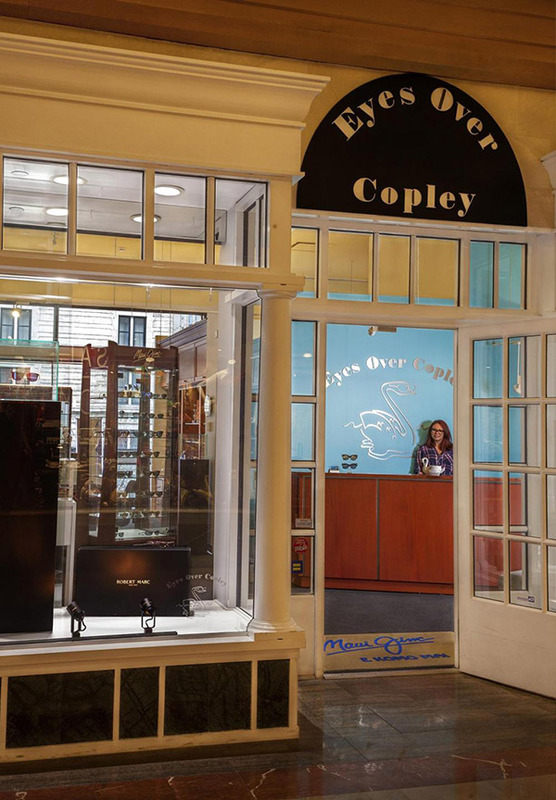 Welcome to Eyes Over Copley serving as your optometrist in Boston, MA. Dr. Patricia Fox provides complete optometry services ranging from routine eye exams to post-operative care for laser vision correction. Whether you are new to Boston and searching for an eye doctor for your family, or you want a change, we are ready to assist you. The primary way for Dr. Fox to determine your vision needs is through a comprehensive eye exam. The American Optometric Association recommends that all individuals with normal vision should get their eyes examined once a year. If you are at risk for vision problems or eye conditions you will want to get an eye exam every six months. During a routine eye exam, Dr. Fox uses various tests and techniques to check your optical health. We also provide advanced testing, such as glaucoma testing, for specialized eye conditions. If you have not been to the optometrist in Boston for an eye exam, it’s a good idea to schedule an appointment soon. Early detection of vision problems is the best way to provide optimal care so you are less likely to suffer from permanent vision loss. Another type of exam we offer is the contact lens exam. This exam helps us determine the appropriate prescription for your contacts. We can assist you by providing a contacts exam, as well as a prescription for eyeglasses. This includes the Optomap retinal exam featuring new technology for a faster and more efficient method. After you have completed your contact lens exam we can assist you with ordering contacts. You can do this in our office or through our website for your convenience. Get your contacts delivered directly to you or via our office for pick-up. For individuals who want to avoid wearing contact lenses or eyeglasses, we provide laser vision correction services. As your Boston optometrist, we do not perform eye surgery including LASIK in our office. However, we do offer pre- and post-operative care for patients who have had laser vision correction procedures. If you think you are a good candidate for vision correction surgery we can help you out. Through our comprehensive eye exam, we can determine if you would benefit from eye surgery, such as LASIK. In general, most patients who have refractive conditions including astigmatism, nearsightedness, or farsightedness are good candidates. However, you can’t have an eye infection or be in poor health to be a good candidate. Let us help you with an optical evaluation today. Meet Your Local Optometrist in Boston, MA today! We are excited that you are considering Eyes Over Copley as your optometrist in Boston. Dr. Fox provides comprehensive optometry services for your entire family in a comfortable setting. If you want to get an eye exam, contact lenses, eyeglasses, glaucoma testing, or pre- or post-operative care let us assist you. Contact Eyes Over Copley today at 617-859-0630 to schedule your appointment with an eye doctor near you. We look forward to becoming your leading optometrist in Boston, MA. We offer a wide variety of Maui Jim Frames. Call us to learn more! "I've had great experiences with Eyes Over Copley. It was easy to get an appointment within a week of having an issue. I like the downtown location and my last visit had me ending up at the MFA afterwards." "Great service and attention to the patients. Dr Fox’s doesn’t just exam you; she infuses the appointments with lots of information about cutting edge practices and trends."